Pre-heat oven to 240. Pour boiling water over the skin side of the meat then pat dry (this helps with creating the perfect crackling) Mix all the dry pork ingredients with the olive oil and rub into the meat. Pour the cider into the bottom of the roasting tray and place in the oven for 30 – 40 mins to crisp up the crackling. Turn the oven down to 130 and cook for a further 30 minutes. Remove the tray from the oven and add the stock to the bottom of the tray (do not pour over the meat as it would ruin the crackling) and return to the oven for a further 2 hours. Take the pork out of the oven and rest (under the tinfoil) for at least half an hour. Leaving the skin on the beetroot bring to the boil and simmer for 30 – 40 minutes. Peel the skin off and cut into small segments – about the size of satsuma segments to ensure a melt in the mouth texture. Slice the red onion and mix with the beetroot and all the other ingredients in an ovenproof dish. Cover with foil and roast for approx 1 hour at 200 or if cooking at the same time as the pork for approx 2 hours at 130. Once you have taken the pork out to rest, remove the foil from the beetroot and cook for a further 20 minutes. Mix all the dressing ingredients together – this can be kept in the fridge until ready to use. 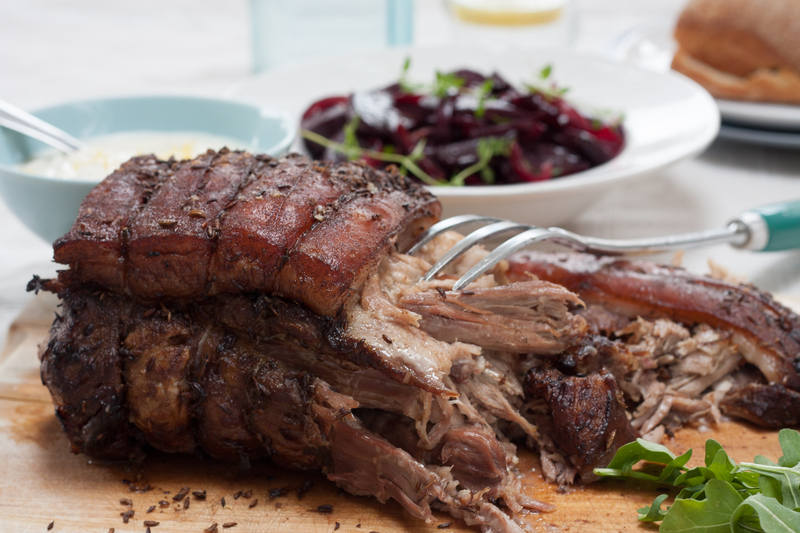 When the pork has rested use 2 forks to crumble the meat and serve in a lovely crusty roll with the sticky beetroot and creme fraiche dressing and some rocket or watercress.